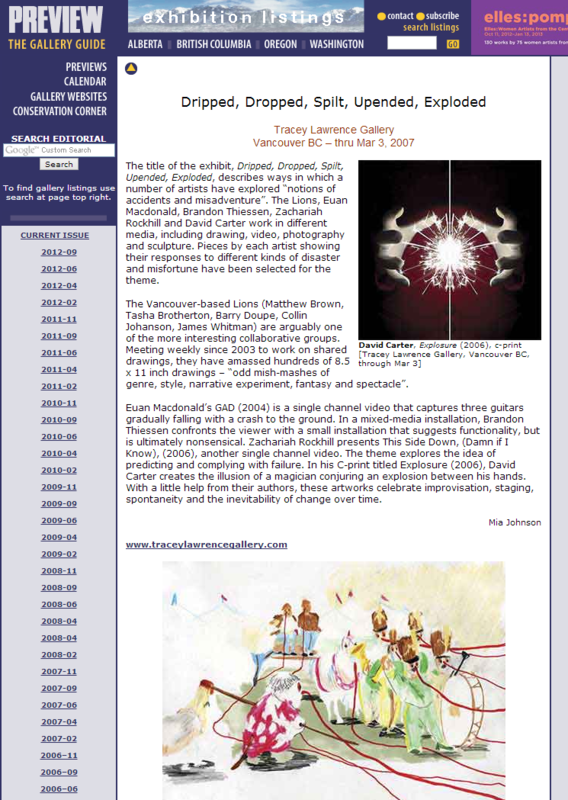 The title of the exhibit, Dripped, Dropped, Spilt, Upended, Exploded, describes ways in which a number of artists have explored “notions of accidents and misadventure”. The Lions, Euan Macdonald, Brandon Thiessen, Zachariah Rockhill and David Carter work in different media, including drawing, video, photography and sculpture. Pieces by each artist showing their responses to different kinds of disaster and misfortune have been selected for the theme. The Vancouver-based Lions (Matthew Brown, Tasha Brotherton, Barry Doupe, Collin Johanson, James Whitman) are arguably one of the more interesting collaborative groups. Meeting weekly since 2003 to work on shared drawings, they have amassed hundreds of 8.5 x 11 inch drawings – “odd mish-mashes of genre, style, narrative experiment, fantasy and spectacle”. Euan Macdonald’s GAD (2004) is a single channel video that captures three guitars gradually falling with a crash to the ground. In a mixed-media installation, Brandon Thiessen confronts the viewer with a small installation that suggests functionality, but is ultimately nonsensical. Zachariah Rockhill presents This Side Down, (Damn if I Know), (2006), another single channel video. The theme explores the idea of predicting and complying with failure. In his C-print titled Explosure (2006), David Carter creates the illusion of a magician conjuring an explosion between his hands. With a little help from their authors, these artworks celebrate improvisation, staging, spontaneity and the inevitability of change over time.